Whatever happens, it looks increasingly likely that a Brexit delay will be needed. An Article 50 extension is the most likely way of achieving this, although EU member states would need to unanimously agree to it and that requires a legitimate reason for doing so. In the wake of the historic defeat on Theresa May’s Brexit deal, Britain's Leader of the Opposition Labour Party Jeremy Corbyn has put forward a motion of no confidence in the government. This will be voted on at 7 pm GMT on Wednesday. However, if this no-confidence motion is to succeed, it would require a handful of Conservative or Democratic Unionist Party (DUP) MPs to get behind it. So far, the DUP have indicated they would support the government in this scenario, and it seems unlikely that many Conservative MPs would vote their own party out of government. So as things stand, the no-confidence motion is likely to fail. Importantly though, there’s nothing stopping Jeremy Corbyn putting forward confidence motions again over the coming weeks. From a market perspective, news of a snap election would unlikely to be taken positively. Firstly it would prolong the Brexit uncertainty for longer. On its own, the vote would almost certainly require an Article 50 extension. Even then it could take some time for either a new Conservative-led government to get parliament to approve the deal, or for a new Labour-led government to return to Brussels and put its own stamp on things. The perceived risk of a Labour-led government may also weigh on the pound to some extent. Despite being voted down by a heavy margin, the government has implied that it will have another stab at tweaking the deal, perhaps by aiming to secure more meaningful concessions on the Irish backstop. This begs the question of whether May’s deal will have better luck in gaining support second time around. In our opinion, the chances are fairly low. Firstly, there are big doubts over whether the EU would be prepared to offer the legally-binding concessions on the Irish backstop that Conservative and DUP MPs are demanding. That was made pretty clear again by EU leaders on Tuesday night. Brexiteer MPs are adamant that a hard deadline on the Irish backstop is needed, but Brussels has so far been clear that this would effectively render this insurance policy useless. The consensus is therefore that the EU probably won’t budge, although if it were, presumably it would want to be 100% sure any concessions would secure the backing of Parliament. Importantly, that is unlikely to be the case. Even if Theresa May does manage to get what Brexiteer MPs are asking for, the bar to get the revised deal through Parliament remains high. The approx 115-120 votes required to turn things around means there are a seriously high number of lawmakers needing to be convinced. In fact, the Northern Irish DUP have made it pretty clear they won’t vote in favour of any deal that still contains a backstop at all - hard deadline or not. Realistically this means that the only way May’s deal will get through would be if lawmakers eventually baulk at the prospect of ‘no deal’. Remember before Christmas, various commentators (ourselves included) were pointing to potential similarities with the TARP (Targeted Asset Repurchase Programme) in the US, where lawmakers voted down the crisis-recovery package, only to back it a few weeks later when markets began to collapse. Of course, the fact hasn’t changed that ‘no deal’ remains the default option on 29 March, unless lawmakers can rally around an alternative course of action. However, in reality, it now looks much more likely the UK government would try to apply for an extension to the Article 50 period to avoid a hard exit. If MPs make a similar calculation, then they are arguably less likely to be persuaded to back a deal simply to avoid an exit on WTO-terms. The calm market response to Tuesday’s result suggests investors might be starting to think along similar lines. Theresa May said in the immediate aftermath of the vote that she is prepared to reach out across the house to find out what MPs want - and it might not be long before we find out whether lawmakers can rally around an alternative Brexit strategy. Theresa May is obliged to return to Parliament by Monday at the latest to present her new plan. This will be done in the form of an amendable motion, meaning that MPs are able to put forward their own suggestions on the way forward. So far it’s not clear exactly what will happen, but we may see some MPs take the opportunity to push for indicative votes on different specific options. These may well include a vote on a second referendum, as well as on a different Brexit strategy – for instance, a bid to secure a permanent customs union or to go further and push for a ‘Norway Plus’ arrangement (single market access plus customs union). The big question is whether the government will feel obliged to act on these votes if they indicate that a majority of lawmakers favour a certain option. These votes wouldn’t be legally binding, although the political pressure for the government to follow the will of Parliament would likely be immense. Whatever happens over the next few days, time is running out. 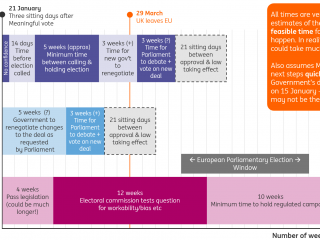 If one of these options is eventually pursued – be it next week, or perhaps more likely after the government has had another attempt to pass its deal – they would require more time. Despite the staggering scale of the loss and the Labour party triggering a no-confidence vote, the FX market found a silver-lining and GBP strengthened. This is likely a function of (a) the rather low probability of today’s no-confidence vote being successful (as gauged by the comments from the DUP and the pro-Brexit European Research Group) and (b) the increased likelihood that the Prime Minister may have to seek cross-party support for the new plan, with the perceived odds of an Article 50 extension rising. We estimate that the probability-weighted outcome for GBP has marginally improved - by one big figure for both EUR/GBP and GBP/USD based on our estimates. This is because the somewhat lower likelihood of an imminent early election (see Brexit and the bumpy ride to its eventual recovery, where we explain this was one of the outcomes that would be GBP negative under the Article 50 extension scenario), marginally lower perceived odds of a hard Brexit (given the opposition to it in parliament and more vocal talks about an Article 50 extension) and a rising probability of a form of deal eventually obtaining support in parliament (given that Theresa May may well now consult other MPs). But while the probability-weighted outcome for GBP may have improved somewhat, and GBP dips may be now used by investors as an opportunity to close their existing shorts and/or embark on speculative (but still tricky) GBP longs, the near-term price action for GBP will still remain very bumpy. There is still a non-negligible probability of a hard Brexit (around 20% in our view), which would potentially be a detrimental outcome for GBP. This makes the outright long GBP positions tricky, particularly in the context of the upcoming negotiations (domestically among the Conservative party MPs and wider parliament, and externally with the EU) not being straightforward and the associated headline news. As per Brexit and the bumpy ride to its eventual recovery, we see material upside to the heavily undervalued GBP (the cheapest in the G10 FX space) by year-end, as by then we expect a market-friendly resolution of the Brexit stalemate. Yet, the near term price action is likely to remain volatile and headline driven, as has been the case during the past few weeks and quarters. See our 2019 FX outlook: Peak Dollar for more details on our GBP views for 2019.